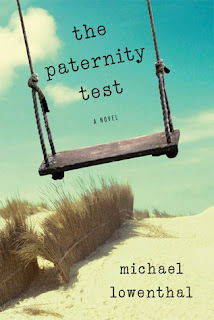 My thoughts: The steps some people take to save a floundering relationship is examined, as are other issues, in The Paternity Test by Michael Lowenthal. Pat and Stu are a gay couple dealing with problems. Stu still picks up other men and Pat thinks a change of scenery will help them strengthen their crumbling foundation. Will a move from the Big Apple to Cape Cod help? Will the addition of a child help too? The Paternity Test is a complex look at the complexity of relationships, human nature and parenting. Once Stu sets the plan to find a surrogate for their child, he grapples with impending fatherhood. If he can't keep his man from straying, what makes him think he'll be more successful as a father? To add a twist, his relationship with the surrogate mother, Debora, develops into something unexpected, further complicating his life with Stu. There were times I didn't like many of the characters for differing reasons and there lies the beauty of this novel. Through the swift currents of change these characters endure, we see how realistically they are crafted. And I certainly did not see the twist coming at the end. The Paternity Test is a testament to the many faces, textures and trials of families, love, and life. Book source: I received a paperback from Book Sparks PR in return for my honest review.